You may think it’s unfortunate enough that social security taxes are already taken out of your paycheck each pay period. The theory behind the social security retirement benefits program is simple. You pay taxes during your working years, become covered under its umbrella of benefits after a certain amount of time, and finally receive benefits during your retirement. But did you know that when you receive your social security benefits in retirement, they may be taxed again? 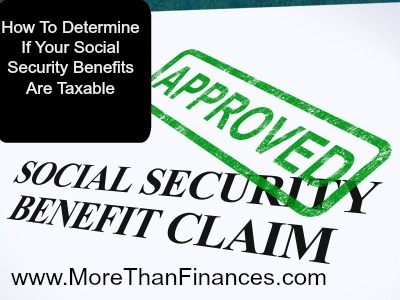 The taxable amount of your social security benefits, if any, depends on a combination of your benefits and your other income. Usually, as this total increases, a bigger percentage of your benefits is subject to tax. More specifically, if your total other income, which is described below, plus half of your net benefits (box 5 of Form SSA-1099) is greater than the base amount attributed to your filing status, some of your benefits will be taxable. We’ll discuss the base amount later. Your total other income includes taxable pensions, wages, interest, dividends, and tax-exempt interest income. In addition to this, some exclusions – such as interest from qualified U.S. savings bonds, exempt adoption benefits from your employer, foreign-earned income, foreign housing, and income earned in American Samoa or Puerto Rico by bona fide residents – must also be included in your other income. Calculate the total amount from box 5 of all your Forms SSA-1099. Calculate half of the amount from line 1. Calculate the total amount of your taxable pensions, wages, interest, dividends, and other taxable income. Calculate the total amount of any tax-exempt interest income (such as interest on municipal bonds) plus any exclusions from income (listed earlier). Add lines 2, 3, and 4. Compare the amount on line 5 to the base amount for your filing status. If the amount on line 5 is less than or equal to the base amount, none of your benefits are taxable. If the amount on line 5 is more than your base amount, some of your benefits may be taxable. $0 if you are married filing separately, and lived with your spouse at any time during the tax year. In most cases, up to 50% of your benefits will be taxable. However, up to 85% of your benefits can be taxable if either of the following situations applies to you. The total of half of your benefits and all your other income is more than $34,000 ($44,000 if married filing jointly). You are married filing separately and lived with your spouse at any time during the tax year. If some of your benefits are taxable, use the social security benefits worksheet – found in the instructions for IRS Form 1040 (page 28) or 1040A (page 29) – to calculate the actual amount of your taxable benefits. And for more detailed information, check out IRS Publication 915. For more needed information on social security and how it affects you read these great articles. This post was included in the Carnival of Financial Planning at My Trader’s Journal. Understanding the steps to calculate social security benefits may not be the easiest thing in the world to do, but here’s my attempt to demystify the process. There are two basic steps to determining your monthly benefits. The first step is computing your average indexed monthly earnings, or AIME. The second step, which incorporates the AIME, is to determine your primary insurance amount, or PIA. The PIA is the basis needed to calculate social security benefits that are paid to you when you retire.